A tense situation reported outside Lake House this evening when a group of United National Party (UNP) supporters reported to have behaved in an aggressive manner. 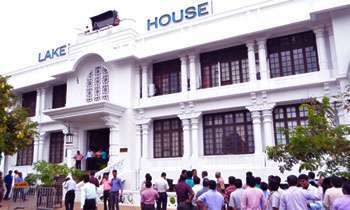 Police said a group of UNP supporters who gathered outside the Lake House building soon after the Supreme Court ruling on the dissolution of Parliament, reported to have urged that posters pasted on the building wall supporting former President Mahinda Rajapaksa be removed. The situation was brought under control when the Special Task Force and Riot Police personnel arrived at the location. Security around the Lake House premises was tightened following the incident. Meanwhile, the Police said an investigation was launched after a female UNP councilor had lodged a complaint with the Fort Police stating that she was assaulted during the incident. Do not let the sc verdict cause any riots. We have experienced the ugly moments in the past.Also people should not take this opportunity and post any undesirable comments to provoke the situation.